Armata and Boomerang and Kurganets and Typhoon are vehicle families. When they talk about an armata unit they mean an entire force of vehicles of all types in a normal division... MBT, IFV, APC, Command, Ambulance, transport, engineer, artillery (rocket and tube) air defence (missile, and "missile and gun"), recon, bridging, etc etc.... more than 30 different types ALL based on the Armata chassis. There will be armata divisions and Kurganets divisions and Boomerang divisions and typhoon divisions... that is 8 different division types because for each vehicle family there will likely be Tank divisions and Motor Rifle divisions.... so there will be tank and motor rifle Armata divisions etc etc etc. Flanky wrote: Well Russians have Sprut that is true however it is a tracked platform. It is ideal in regular conflicts but in Guerilla wars like those in Chechniya you need speed and responsiveness more than crosscountry capability. Flanky, just because the U.S. Ground Forces possess such a vehicle, does not mean the Russian Ground Forces suddenly need one. Such thought is consistent with shills that instantly think the Russian Forces now requires something similar to what the U.S. fields in it's inventories. There you find all sorts of like-minded peers. Again, the reason why the U.S. Ground Forces procured such a vehicle was to fill a gap, a gap that has never existed in the Soviet or Russian Ground Forces. As you have probably found out by now... Putin needs such a vehicle even more than Americans... Im also a fan of not pursuing each and every research and development americans do... but as i said earlier "Stryker" in the ranks of Russian army would be a very good addition. Essentially a wheeled Sprut. This type of vehicle is ideal in guerilla wars, town / village sieges and so on... If Russians today would still fight the great Chechen war and would had this vehicle in their posession it would ake a big differrence. Tanks are slow and bulky, fighting a guerilla infantry needs speed and agility... That is why the Americans have stryker, Italians have Centauro, Japanese have gun on wheels, France as well as many other nations. Caterpilars on Sprut-SD are great for cross country mobility but they are slow, harder to repair and maintain and thus more costly. On the other hand Sprut-K having the cannon too huge would mean vehicle instability during fire. 125mm kicks a lot of recoil punch, so they would have to stabilize it somehow. One more time, the reason why the U.S. Ground Forces procured such a vehicle was to fill a gap, a gap that has never existed in the Soviet or Russian Ground Forces. Flanky, I would advise you to research U.S. Army vehicles and their armaments, and to look at which vehicle with the exception of the Stryker MGS, possesses a 120mm cannon. Take note of this vehicle's ability to carry infantry, or lack of ability. Afterwards, take a gander at the inventory of the Soviet/Russian Army vehicles. There you will find a vehicle with a 100mm cannon, high mobility, and perfectly filling the Stryker's intended purpose . Morpheus Eberhardt wrote: At the parade, I didn't see any Bumerang BTRs, presumably shown in the following image. Morpheus, did you take any pics during the parade that has not been published by various media outlets already? Please re-read my posts again and then lets have a discussion... because caterpilar BMP3 is not going to provide you with a speed of 100kph and more which is required for a quick reaction. Additionally the Stryker being a wheeled vehicle is having better fuel economy and also maintenance of a wheeled platform is easier than that of a caterpilar one. Russia during Soviet times loved the caterpilars because of their crosscountry capability but times has changed since then and today speed and mobility are the focus of modern armies. Being able to react quickly in small local conflicts is the key and BMP3 is not ideal for this. Yanks knew perfectly well why have they put the gun on a wheeled platform - the idea was good, however Stryker as a platform is having difficulties connected with its poor design. BMP-3 provides an exemplary tactical and strategic mobility. Strykers are not going anywhere near 100kph anyway, not even close. They have tipped over from lesser speeds. And indeed, speed and mobility are the focus of modern armies. What you do not realize is that in this aspect, Russia has a lead over everyone. The VDV is absolutely unparalleled. Imagine hundreds of Chechen rebels are spotted by UAV crossing Pankisi valey to Russia... you think BMP3 would be suitable for going to the hills - or a VDV battaliong making paradrop in mountains (with BMDs or Spruts)? This is what i am pointing out... gun mounted on a wheeled platform as a tool combating in an asymetric warfare. Stryker or a wheeled platform in theory could go over 100 kph without problems - something that tracked platform would never sustain. It will quickly get into the region by road and then fight the rebels by supporting local infantry antiterror op. Placing itself against slope full of rebels tearing them apart by HE-FRAG rounds from the gun well outside of common AT weapons reach like rpg-7. And this scenario is not so unlikely taking into account how many of those bastards are fighting in Syria - what would happen when Syrian war is over - they would want to return to Russia with all those weapons.... Again i reiterate there is a GOOD reason why yanks have put the gun on a wheeled platform like stryker and not on a tracker platform like Bradley. Flanky wrote: Imagine hundreds of Chechen rebels are spotted by UAV crossing Pankisi valey to Russia... you think BMP3 would be suitable for going to the hills - or a VDV battaliong making paradrop in mountains (with BMDs or Spruts)? This is what i am pointing out... gun mounted on a wheeled platform as a tool combating in an asymetric warfare. Stryker or a wheeled platform in theory could go over 100 kph without problems - something that tracked platform would never sustain. It will quickly get into the region by road and then fight the rebels by supporting local infantry antiterror op. Placing itself against slope full of rebels tearing them apart by HE-FRAG rounds from the gun well outside of common AT weapons reach like rpg-7. And this scenario is not so unlikely taking into account how many of those bastards are fighting in Syria - what would happen when Syrian war is over - they would want to return to Russia with all those weapons.... Again i reiterate there is a GOOD reason why yanks have put the gun on a wheeled platform like stryker and not on a tracker platform like Bradley. If hundreds of Chechen rebels are spotted by UAV, then they can be targeted by things like arty, helos, bombers,tactical and theatre ballistic missiles, etc. BMP3 and other tracked platforms are usually better for firing of angled platforms btw. Strykers have never gone over 80kph. I could just paradrop a VDV battalion in wait for these rebels. A full VDV paradrop that travels by plane and then drops and drives to the target area will always be faster than wheeled platforms. The reason why the Yanks got the MGS is because they had no BMP-3 to provide cover for troops. Bradley was also pathetic. The reason why the U.S. Ground Forces procured such a vehicle was to fill a gap, a gap that has never existed in the Soviet or Russian Ground Forces. By "at the parade" I was just referring to the pictures and video reports from the parade. Is this sucker big or what? Wow! They were the very last vehicle to be paraded...only 4 or so models. When you see it like that... yeah, pretty freakin' big. I guess no one will be riding on top of that, unless they're prepared to rappel down. Good footage showing Kurganets-25 chassis being made at a Kurganmash factory, at '2:24' you see what a completely stripped down Kurganets-25 chassis looks like...someone do us a favor and post a screen capture of it. Stryker AGS are for what I know produced at a very slow rate, never reached full scale production, i think less than 150 for all US Army. Also a motorized btg equipped with BTR-82 and some Vena would deliver more firepower than a similar Stryker based unit. Are there any images of them? I'm on mobile right now so there isn't much I can post, but this is one image I managed to find. If you re-watch the latter part of the parade you will see the Bumerang finishing off the land vehicle segment. Mike E wrote: I'm on mobile right now so there isn't much I can post, but this is one image I managed to find. If you re-watch the latter part of the parade you will see the Bumerang finishing off the land vehicle segment. The image you posted shows the Bumerang BMP. The Bumerang BTR has the small turret of the Kurganets-25 BMP. The picture I posted is from the practice at Alabino with the canvas covering the turret. 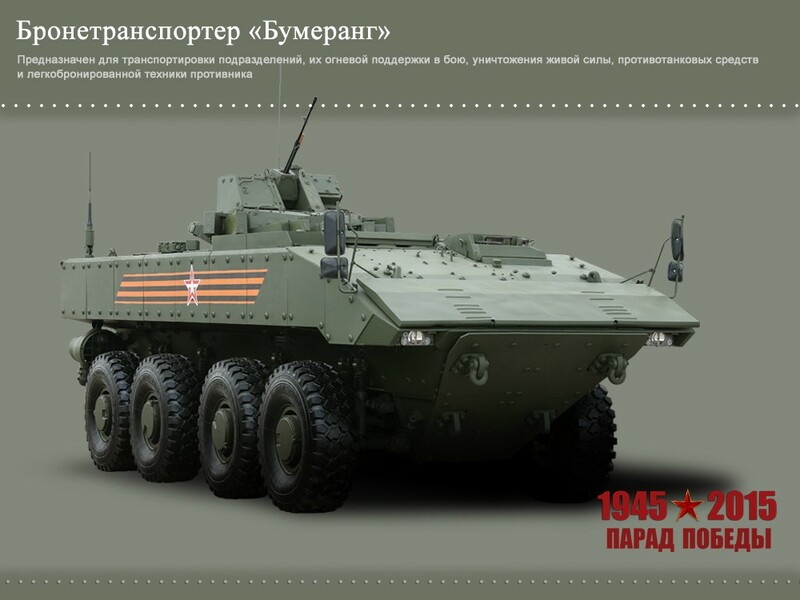 One other role of the BTR versions of Kurganets-25 and Bumerang, apart from those I listed in an older post, would probably be that of the control vehicles for the robotic assets. Well each fight is about what tools are available to you as a commanding officer. Arty might need a FO to guide the bombardment. UAV can provide but how fast are you able to place your artillery units on a designated place to be within range? Is this your opinion or is there a science behind it - if there is science care to explain? Because usualy tracked platforms are heavier than their wheeled counterparts and thus slopes are much of a problem to them than to their wheeled colleagues because the heavier the mass the bigger gravitational force that is resisting the vehicle to go up the slope. You want to paradrop a vehicle in the mountains? Vehicle paradrop is very risky in any terrain other than plain or big valley... In mountains huge winds can cause the vehicle to be veered of from the expected drop site miles and miles away and not just that but it might also land on a slop in which case it might release itself from the paradropping platform and fall of the cliff and other nasty things... Have you seen a vehicle being paradroped in mountains? And let me also tell you that preparing a VDV regiment for a paradrop is not so easy nor is it that fast as you might think. Planes have to be ready, stationed at nearby airfield and paratroop units have to have their equipment ready. Another thing is in order to minimize causalties on your side you have to wipe out enemy as fast as possible and for that you need heavier weapons. Infantry might not be enough and Su-25 and airforce in general is not good in slim an tight mountain valleys... the standard issue Su-25 does not have equioment to fight in bad weather and couple of them even crashed because of weather / low visibility in mountains... No matter how i look at it Gun on wheels is gun on wheels and it has its own unique place... or do you think they would have been researching something they don't need... especially after the T-95 fiasco? The last time Russian troops have been piggybacking BTR's/BMP's and gotten in an ambush, beaten that ambush off and killed half the ambush party...Better yet, Ukrops driving in BTR4-K have been found BBQed in late August. Yea but it beats the entire logic of using armoured troop carriers when troops are being carried on the top unprotected? Flanky wrote: Yea but it beats the entire logic of using armoured troop carriers when troops are being carried on the top unprotected? Once again you have to decide what you are arguing about. The initial BTR's were just dedicated guntrucks. Then the current armored car tendency since the 60P makes them only so much more safe (HMG's could already punch through them then, making them good tincases for dead motorized infantry. Over the time the protection has only evolved so far as to have the guys inside die from suffocation. The number one protection on most current system (bar IED/AT mines) is first and foremost their SA (situational awareness). PAssive protection is doctrinally secondary. It is a case of see first/fire first/kill first. The idea behind the protection upping up comes from totally different experience and that is low intensity warfare the Western Powers have been committed to since more than a decade. This is coincides with many a lesson the SADF has learned the hard way in un-hospitable places during its own run in with "irregulars". However, all this becomes useless when you face an enemy whose assets consist on heavy area saturation artillery and who can interdict whole lines of transit on a pinch. IE real war. Once your 30 ton behemoth gets "saturated" you better have a different plan than stay put in your well armoured truck that would have some quality time with OPFOR infantry and its ATGM's. That's something I still don't understand with the new Russian lineup. It is "better", but is it more suitable to their needs in the long run? ...Hmmmm, looks like not too many people seem interested in discussing what a stripped down Kurganets-25 chassis looks like.